Charles Keller gold and blue enamel cufflinks, circa 1925. Charles Keller & Company was a prolific maker of fine cufflinks during the early 20th century. Although not as recognized as Carrington & Company or Wordley, Allsopp & Bliss, Keller created beautiful cufflinks in a variety of distinctive styles. Among the firm's specialties were cufflinks that elegantly accented rich yellow gold with regal blue enamel. The cufflink pictured above is a wonderful example. Set with small diamonds and featuring beautifully engraved centers, the corner's of the cufflink are finished with stylized floral motifs highlighted in vibrant blue enamel. Charles Keller enamel cufflinks, circa 1925. The intricately engraved centers are a miniature scene of a rippling body of water with upward striving plants in the foreground. The theme of aquatic flora is repeated in the blue enamel and gold motifs of the corners. Crafted in 14kt gold, circa 1925. Charles Keller 10kt gold cufflinks, circa 1925. 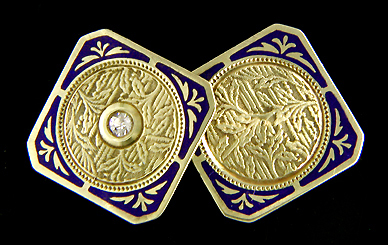 Keller created cufflinks in both 10kt and 14kt gold. The above 10kt gold cufflink features a dramatic star burst or stylized flower head motif. Around the edges an inward-turning stipple pattern is outlined in blue enamel. The lower karatage gives the gold a pale, almost washed out appearance that nicely contrasts with the bolder color of the enamel. 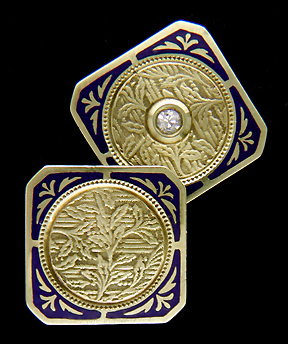 Charles Keller Arts & Crafta cufflinks, circa 1910. This pair of Keller cufflinks is from the Arts & Crafts period of the early 1900s. The yellow gold centers are polished to a mirror-like finish and surrounded by captivating blue enamel borders. A wonderful example of the simple elegance of Arts & Crafts design. The maker's mark of Charles Keller & Company is an elongated "C" followed by a "K". Inside the "C" a "10" or "14" indicates the purity of the gold. 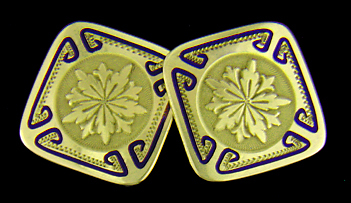 The maker's mark is usually found stamped on the crossbars (as pictured above) or the reverse of the cufflinks. Charles Keller & Company was founded in 1885. The firm created gold and platinum cufflinks, lockets and other jewels in a workshop based in Newark, New Jersey. From surviving examples, it is clear the firm created cufflinks in a great variety of styles. Charles Keller & Company remained in business until the early 1930s. 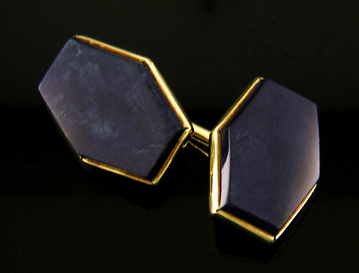 Charles Keller sodalite and gold cufflinks, circa 1925. In addition to beautiful blue enamels, Charles Keller & Company also created cufflinks set with striking blue gemstones. This blue and gold pair features the exotic gemstone sodalite. The gemstone is reminiscent of a dark night sky with a few wispy clouds illuminated in the moonlight. Along with Lapis lazuli, sodalite was favored by Art Deco jewelry designers because of its intense, rich blue color. Recent additions to the Antique Cufflink Gallery include elegant blue enamel and diamond cufflinks, exuberant Wordley, Allsopp & Bliss two-tone links, a pair of classic platinum and gold ovals by Carrington, striking Tiger Eye spool links, and frosty Carter, Gough snowflakes. Keller Blue and Gold II An amazing pair of Charles Keller cufflinks with blue enamel accents and sparkling diamonds. The navy blue enamel beautifully contrasts with the warm, rich tones of the yellow gold. Crafted in 14kt gold, circa 1920. Garlands and Swags Exuberant two-tone cufflinks from the 1920s. Yellow gold centers feature classic garlands and swags surrounded by white gold borders with a bold geometric design. Crafted in 14kt gold, circa 1925. Carrington Classics A beautiful pair of Carrington ovals with linearly engraved centers surrounded by spiralling, twisted-ribbon borders. Crafted in platinum and 14kt gold, circa 1925. Tiger Eye Striking cufflinks with beautiful Tiger Eyes set in rose gold. The Tiger Eyes are brown accented with just a hint of green and rich honey colored "eyes." Created by Sansbury & Nellis in 14kt gold, circa 1920. Carter Snowflakes Striking eight-sided cufflinks with dramatic snowflake or star burst designs surrounded by elegant, upsweeping borders. Created by Carter, Gough & Co. in 14kt white gold, circa 1925.